Interface with the 'Dat' p2p network protocol < https://datproject.org>. Clone archives from the network, share your own files, and install packages from the network. datr allows R users to interact with the Dat network. You can load, store, or share data on the Dat network, without including any intermediaries that can snoop on your content. All transfers are end-to-end encrypted. See below for Windows, Mac, and Linux specific instructions for installing Dat. v0.1.0 will be submitted to CRAN (almost done 🏁)! 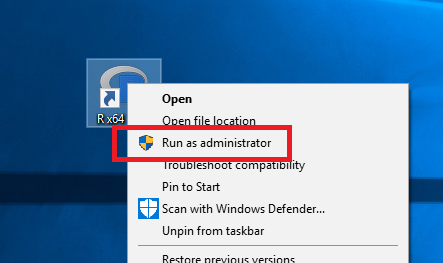 Fire up R with Administrator privileges by right clicking the icon and selecting "Run as administrator"
Once the program launches, run datr::dat_install(). The package then initiates downloading Dat and installs it on your local machine. Note that there currently is an issue out that could benefit from feedback on installation on Mac (#7). This project is released with a Contributor Code of Conduct. By participating in this project you agree to abide by its terms. We welcome you with open arms if you are mindful and respectful of differences. You might not always understand another person's perspective; acknowledging that other people's feelings or perspectives are valid regardless of your understanding is prerequisite number one to being both mindful and respectful. We will not consider contributions if they are not done in a respectful manner, no matter how "genius" they might be. All code is licensed GPLv3. All non-code assets are available under a CC 0 Public Domain Dedication. RStudio does not like interactive system calls, which this package is based on (see also issue #8). Beware!